← ROW80 12/7/11: Have You Jumped On The Slacker Train? My first job out of college was as an autism specialist for the Judevine Center for Autism, based in St. Louis. It was like learning a strange language in a strange land. 1. Autism is like having all your senses hopped up on crystal meth. Imagine the world if you sat in a restaurant with your over-sensitive senses sparking at warp speed. You’d smell the five different shampoos used by your surrounding diners, hear the clink of silverware and the sound of people’s feet scuffing the floor, the air rushing through the vents, along with the hum of traffic outside. And have no ability whatsoever to tune all that sensory input out. Ouch, ouch, OUCH! 2. “Please” and “thank you” imply that a request is optional. One of the most difficult things for me to learn when I was going through my training was to leave what I considered good manners at the door. The autistic brain is a very concrete one which often makes manners and pronouns difficult to grasp. For example, the terms “yes” and “no” are quite ambiguous: “Yes, WHAT?” or “No, what? ?” Adding “please” to a request for an autistic person (in their mind) implies a choice. If it’s something they didn’t really want to do in the first place, it’s likely they’ll just say “no” and go back to their preferred activity. This lesson has carried into my own parenting. I rarely tell Baby Girl “no” when she’s heading toward disaster — I tell her to “Stop.” It’s concrete and immediate, and so far, it works. 3. Grandmas are damn smart. If you set up a storyboard about the things that will happen in an autistic person’s day with pictures, so much the better. Remember, you’re dealing with a precise individual. 4. Few autistic kids understand the concept of time. Oh, they learn about time if you tie it to a reward – most of these kids are brilliant after all. But that intrinsic knowing that this is ten minutes and it takes that long to brush my teeth, wash my face and put on my clothes for school is almost always missing from an autistic kid. It’s tiring to sequence all day long, but not as tiring as dealing with tantrums when your kid doesn’t understand why they have to stop doing whatever thing they love to do. If they know what to expect, they’re not as frightened. Imagine how you’d feel if you had no idea how long you had to sit in a car or do something you hated – you get through activities you hate only because you know when they end. 5. Positive reinforcement fixes everything. In #1 above, I mentioned all the sensory input bombarding an autistic person in a restaurant. This can be overcome, it just takes some work. The wise parent undertakes the task in stages, first getting their child into the car for a short trip and reinforcing them until car rides aren’t stressful. The next stage might be stopping in to a restaurant during a non-busy time of day and sitting at the table for a few minutes. Eventually, you will work your way up to a full meal. Whatever it is that’s important to you, break it down into small reinforceable steps and prepare to do each step many, many times. There is a lot of humor inherent in interacting with autistic individuals. Most of them have NO idea that others see the world so much differently than they do and the conversations that result from this are often hysterical. The founder of the Judevine Center was a magnificent lady named Lois Blackwell. She was pretty much the goddess to all the teachers and specialists at the center. One of the teachers I knew had a really bad moment one day when she encountered Mrs. Blackwell during a “manners” lesson with a boy named Adam. She was teaching Adam how to make small talk such as “Hello, how are you?” when he saw Mrs. Blackwell, who was a bit plump at the time, walking down the stairs. He walked right up to her and they went through their hellos and how are you’s. Teacher: You cannot say that someone is fat. It’s not polite. Adam: But she IS fat. Teacher: Sigh. You can’t SAY it. The word ‘fat’ makes most people feel bad. Adam: She should get skinny then. Teacher: Bigger sigh. You need to find something positive when you greet someone. Like, “I really like the color of your dress” or “You look very pretty today.” But you cannot say that someone is fat. Adam: Even if they are? Teacher: Especially if they are. Do you have any autistic kids in your life? What have you learned from them? How many of the above techniques do you use with the other children (or furry kids) in your life? Enquiring minds always want to know here at More Cowbell! This entry was posted in Inspiration, Parenting and tagged Autism, Grandma's Rule, Jenny Hansen, Judevine Center for Autism, More Cowbell, parenting, Premack Principle, teaching. Bookmark the permalink. You may have had formal education in this area, but I suspect your brother has taught you a lot. The funny thing, since he was born when I was 19 (and was a normal baby) was that I’d had the training before I saw him in his full blown autism at 21 months. I immediately begged them to test him and my father refused. He was finally tested and treated at 5 years old and those wasted years have always really bothered me. He could be so much more developed than he is if the proper steps had been taken. You did what you could in those early years. Since then, your knowledge has benefitted him, and his presence has benefitted you. Sounds like a good deal to me. This was a fascinating breakdown of the challenges of autism. I read two books from the perspective of an Aspberger’s Syndrome person (on the autism scale, I know, but not quite there) that helped me see more things from their perspective: The London Eye Mystery (YA) and The Curious Incident of the Dog in the Night-Time. My husband and I also had some experience supervising an autistic child, and it was interesting. Concrete definitely worked better. He was socially difficult at times, yes, but he was a brilliant artist – amazingly talented. Thanks for sharing, Jenny. Thanks, Julie. Temple Grandin’s books are good reading, especially the first one where she talks about inventing her squeeze box. However the book I read that stayed with me, partly because I met them, was Annabel Stehli’s book, “The Sound of a Miracle.” She wrote about her daughter, Georgiana Thomas and how auditory retraining gave her new life. What a beautiful post Jenny! And the story at the end – hilarious! My godson has Aspergers Syndrom and as I was reading the conversation, I could totally see him doing JUST that. Being with Austin has taught me so much. He sees his world as very black and white and teaching him all the nuances of grays in the world has been a challenge. He takes everything very literal and he asks a TON of questions. He tends to opt hard for routine so his mother is always having to try and challenge routine to keep him growing and pushing outside his comfort zone. He’s very picky about food and hates trying new things BUT if there is a reward involved, he’s IN and has discovered many new foods that way. Sequencing is very important to him – he likes to know what is expected of him in detail. But the thing that’s most amazing about him, is his incredible spirit and sense of humor. He’s just an oustanding boy and he makes me want to be a better person! Nothing like a little Aspergers to liven things up, eh? My brother would eat like 10 foods and he was a wild man about them. Ex: He loved hardboiled eggs, but wouldn’t eat them if the outside had any nicks. Loved cold hotdogs, but they couldn’t be crushed. Cheddar cheese, but wouldn’t eat it unless the slice was completely symmetrical. He drove his mama nuts over food. Thanks for this, Jenny. I didn’t know you had worked with autistic kids. My 4-yr old son was recently diagnosed with high-functioning autism. He’s basically Asperger’s with a pragmatic speech delay. We’re pretty much learning as we go along here. The sequencing thing is vital for us. We learned the hard way that a complete meltdown would ensue when it was time to end a fun activity unless we had prepared him with knowing the schedule–first we’ll eat, then we’ll go play at the park, then we’ll go to the store, etc. If he didn’t know what was coming next, he NEVER would give in to leaving the fun activity. Some days can be very frustrating, but I try to keep in mind he just has a different way of thinking. It’s hard to wrap your head around having a brilliant kid (he taught himself to read by 3 and has a memory that stuns me) who also can’t really have a regular small talk conversation. Your son is the perfect age to set up a storyboard. – Get a very light bulletin board that can be carried around the house. – If it isn’t covered with material that velcro will stick to, buy some and staple it on. – Print or cut out pictures that represent his daily activities and laminate them. – Glue some velcro to the back of each picture. – Some kids like to hold their picture in a pocket while they do the activity. If he is such a child, make a show of having HIM put the picture back on the board, perhaps to the right side as something already done. When you’d like to teach him time, get pictures of the clock in all the times of the day and staple them to the board in order. The pictures will then go to the right of the time. If you make the pictures small enough, you can have several pictures in one time slot. Thanks so much, Jenny. Kidlet uses that picture schedule at the new school he just started, but we haven’t implemented it at home yet. Sounds like something I need to do, would probably help since he’s such a visual learner. Thanks again! Oh wow-wow-wow-wow. Jenny thank you. As you know I”m in the middle of edits on the thriller. You may not be aware that one of the characters is an autistic child, along with his service dog. This helped enormously! And I’m so pleased to see that I’m on the right track re: interactions/motivations/characterizations. Not to devalue or insult autistic people at all–but premack, routine, sequencing, chaining, etc also figure a great deal in my dog/cat behavior consulting. I do know that you’re ALMOST DONE WITH YOUR BOOK (WOOT!). Sorry…got a little excited there. I did not know you had an autistic kid in it. Go read the books I talked to Julie about above. The one by Stehli describes the behavior really well. It’s good that you made it a little boy since it’s still more prevalent in boys, and 50% of autistic kids are non-verbal. Your comment on the dogs cracked me up because the training process with a puppy, a toddler of any type and an autistic person are REALLY similar. Don’t feel bad at all – and read ALL of Temple Grandin’s books. She talks a lot about autism and animals. Wow, I’ve never dealt with anyone like this – but you certainly brought it home with your insider description of not being able to filter… Wow. Thanks so much for this, Jenny. I learned a lot. You are welcome, Miz Laura. I can’t believe you’ve never run across anyone autistic. 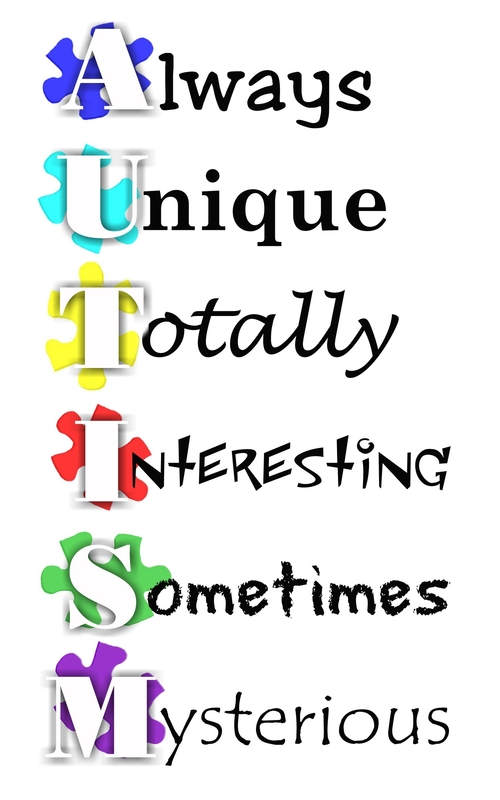 Back in the day when no one diagnosed it, this would be that uncle or cousin that was just “a bit odd.” I meet undiagnosed autistics all the time. I have a cousin with autism and that whole manners thing was a BIG issue with her. Of course, she was diagnosed at a time when they were JUST figuring out what it was, at least in our area, before that none of the family had ever heard of it. The issue with my cousin became consistency. I’ve heard it said that mant autistic people see the world more like how we think animals see things, and it at least holds true in that need for consistency. There was an issue with her mother trying to follow all the proper advice and set guidelines, while some of the family wanted to cut her some slack because of her “disability”, not understanding that the autism meant it was even more imperative NOT to cut her slack because if she got away with something once, it was hell trying to reteach her. Thankfully from what I’ve been told, she is doing quite well now and is even going to college. Then you’ve got me, who shares certain “spectrum” traits, including severe phobia of change and sensory overload (which, by the way, gets worse the more stressed you get, so it gets into this nasty cycle where the overload of sensations stresses you out, then you get even more sensitive due to the stress which stresses you even more which makes you more sensitive until you’re pretty much this bawling puddle of anxiety and rage and unhappy – it’s delightful). While I have never been diagnosed with anything, my family, including my sister who has worked with autistic kids, suspect that I have some high-functioning form of something along the spectrum (possibly Asperger’s or similar but we haven’t got a clue) – problem being it wasn’t really widely known when I was a kid, so I was just “that weird quiet kid who has trouble listening sometimes”. I have NO clue where to look to find somebody qualified to diagnose and treat it in adults, but I’m thinking I need to, because at the very least that phobia of change has caused some rifts. I’ve been able to sort of get through the social challenges (though it seems job interviews are still a bit of a problem – according to my sister my gestures and facial expressions don’t always match up, which annoys me because I’ve tried that whole practicing in front of a mirror thing, apparently when the mirror goes away I lose it again) – the resistance to change I have yet to learn how to control, and my normal methods of handling anxiety do NOT work AT ALL so at the very least, I need help for that one. It does, however, seem to give me an edge when dealing with animals. I understand them better than people a lot of the time, and they seem to realize it and respond. I notice things that they do, that other people don’t, so I can usually figure out what’s wrong with my critters if their behavior suddenly goes sour. I’ll bet you are magic with animals and I’m hoping that you’ve made your career there. Have you read any of Temple Grandin’s books? I’ve always thought that adults could benefit greatly from the squeeze box she developed. Also, I don’t know where you live, but many universities have studies going where they will include adults with autism. You might inquire if you live anywhere near such a place. For example, here on the West Coast, UCLA has done amazing work. Dr. Ivar Lovaas has done groundbreaking work as well. And the Judevine Center in St. Louis can point you toward resources for adults. I was never TAUGHT so much as… forced to figure it out, I guess. I always got along better with the teachers than with the other kids… With me it wasn’t the hurting other people’s feelings that was a problem, so much as something coming out wrong and poeple making fun of it. I have a tendency to not think in language (not in pictures either just… amoprhous thoughts), so sometimes things get lost in the translation (even though I do seem to learn foreign languages more easily than I’m told most people do… maybe that’s why?). It’s so much easier in writing. I still have issues with worrying I’m talking too much or too little, or staring, or just that I’m doing something WRONG and maybe the other person thinks I’m annoying or crazy. There’s this sort of paranoia you develop. >.< Or at least that I did. I mean, I think there were some advantages to just sort of… being tossed in the pool without a float, so to speak, but I do think I missed out on some help I may have needed. But I figure if I can recognize it and work on it, I may yet be able to tackle it. I have Animals in Translation – saw it at one of the college bookstores when I was still in school and couldn't resist. Have yet to finish it though (my attention span for nonfiction is sadly very short, I need to work on that again). I have a living squeeze-box thanks to the other half being able to give bear-sized bear-hugs. 😉 But yes, I do want to seek a career in animal behavior – took human psychology, anthropology… want to take what I learned there, mostly the taking things and analyzing them, into the animal field. Been tagging along at Amy Shojai's blog ever since I stumbled across her and she sent me a few links to help me on the way. I live in Ohio – just outside of Columbus. The other half has a friend retired from the psychology field who may have some connections we can tap, we just haven't had time lately. Thanks for sharing Jenny! I have 3 nephews with autism, they are sweet and super smart, but my sister definitely has stories much like your “fat” one. When I was teaching in an elementary school, I placed my hand on a second grader’s shoulder as encouragement, and noticed her flinch slightly. One of the other teachers saw it and informed me that the student had some form of autism. I suspect it was Asperger’s, but no one told me much more than that. The girl was very intelligent, but so matter of fact that it often came across rude. I was relieved to be told as least something about her, so I could approach things differently with her instead of figuring she was just being a difficult kid. We do the same here with our little guy. Amber, it’s so hard for autistic kids to have a light touch – believe it or not, a heavy pressure doesn’t hurt as much because it doesn’t spark their nerve endings in the same way. Isn’t “Stop!” the best thing ever?? This is a wonderful post Jenny! I have a cousin whose son is autistic but I only see them every four years or so. I have a nephew with dyspraxia. We have tested #3 who has autistic markers but not enough to diagnose him with autism. There wasn’t enough indicators to test for Asperger’s. He’s very visual, so having a schedule with pictures has been key to getting through the day with him. However, combine that with his PTSD… The book I’ve found the most helpful in dealing with him is “When Love is Not Enough” by Nancy L Thomas (the book is actually a guide for parenting children with Reactive Attachment Disorder). Like you, ‘no’ is left for when choice is involved and ‘stop’ when danger is involved (which came from dog training for me, LOL). Touching post, Jenny…and chock full of insight. I worked with a boy with autism during college. He was amazing…barely spoke, but knew every Disney song every written. We communicated through music. I’m pretty sure I got more out of our time together than he did. Wow, what a background you have Jenny. You must be a very patient person. I really appreciated how you broke down the mind of an autistic child. I have never been around autistic children. I believe that all children are special no matter the disability. What a fascinating post, Jenny! My sister has taught Special Ed in Texas for 15 years and the stories she can tell are just as funny as yours. Her kids were sometimes so violent that she had to go to the ER, but she loves her job and those kids. It takes a remarkable person to work with kids with needs. Therefore, it doesn’t surprise me in the least that you once worked with Autistic kids.